Bram Van Velde was the second of four children, born into a modest family, of whom three would devote their lives to art: his younger brother Geer became a painter, and his younger sister Jacoba a writer. From an early age, Bram was attracted to painting, and at the age of 12 he was apprenticed, with Geer, to the firm of Scharjk Kramers, painters and decorators. Having noted his tastes (he painted naturalistic works), Mr Kramer’s gave him an income and invited him to go to North Germany, to Worpswede, which had been well known since 1890 for its colony of expressionist artists. In November 1924 he arrived in Paris, where he was able to live thanks to the 100 florins that his patron sent him every month for six years. He was joined by his brother Geer in 1925. In 1926 Bram showed his work to André Lhote, the director of the Académie Notre-Dame-des-Champs, who offered encouragement. He then tried, through his German artist friend Sophie-Caroline Klöker, known as Lilly, to exhibit in Germany, giving her a dozen paintings, but this project met with no success. In 1927 he did manage, however, to exhibit at Bremen and in Berlin. In the same year the two brothers were admitted as members of the ‘Artistes Indépendants’ in Paris. Bram painted flowers and landscapes influenced by fauvism. In 1930 he discovered the Mediterranean landscape and stayed on the Provencal coast and in Corsica, but was forced to return to Paris, as he no longer had the financial support of Kramers, whose company had been affected by the economic crisis. Paul Fierens noticed Bram’s entries to the Indépendants in 1931. Two years later he wrote L’art hollandais contemporain, in which he referred to the brothers’ painting. In 1932, Bram and Lilly, without resources, left Paris to live in Majorca, where life was cheap. They were driven out, though, in 1936 by the Spanish Civil War, during which Lilly died. Back in Paris he moved into Geer’s flat and his brother introduced him to Marthe Arnaud-Kuntz, a friend of Samuel Beckett’s, and the author of Manière de blanc, who became his new companion. Together they shared a poverty that became increasingly testing. While staying in Bayonne, Bram was called up. As his residence permit had not been renewed, he was incarcerated in Bayonne prison for four weeks. There he made a series of drawings titled Carnet de Bayonne. On his return to Paris, Bram settled in Montrouge. Between 1940 and 1944 he lived in such a state of destitution that he even stopped painting. During this period Samuel Beckett was his only moral support. After the failure of his two exhibitions at Maeght and Kootz, Bram withdrew to the small village of By in the forest of Fontainebleau. He received visits there from Pierre Schneider and Georges Duthuit. In 1948 Duthuit, who had taken over the review Transition, the editorial committee of which included Georges Bataille, René Char, Douglas Cooper, Max-Pol Fouchet and Jean-Paul Sartre, published in issue number 40 an imagined dialogue between Beckett and Duthuit on Bram’s painting, and two other dialogues devoted to Masson and Tal Coat. A second exhibition was held at Maeght in 1952, accompanied by a text by Georges Duthuit titled Bram van Velde ou aux Colonnes d’Hercule, which ended: “Bram Van Velde’s work provides us with the spectacle of this engulfing and everything that it can include as a reply. His work is ‘damaged’, it bruises us in that he himself is bruised” (Derrière le miroir, no. 43). On the day of the opening, only Beckett, the actor Roger Blin who was at the time rehearsing Waiting for Godot, Tal Coat and Giacometti turned up. Two articles appeared in the press: one by André Chastel in Le Monde (22 February) and the second by Georges Duthuit in Cahiers d’Art 1952 no. 1, July, Maille à partir avec Bram Van Velde. In 1948 Bram Van Velde’s works were shown in New York at the Galerie Kootz, the result of a policy of exchange with Aimé Maeght, who in return showed American artists (including Gottlieb and Motherwell). Beckett contributed a translation of his text for which the title (given above) became The New Object. At the end of 1952 he broke with the Galerie Maeght following a further commercial failure. The gallery kept the stock. His small production of paintings did not enable him to exhibit. Bram was 57 years old and alone. In 1953 the first summary of his work – 1937–1953 – appeared in a special issue of Soleil Noir written by Georges Duthuit, who underlined the tragic dimension of Bram’s painting. To find a little escape, Bram, in the autumn of 1953, went on a trip to Venice. He was accompanied by Jacques Putman and his wife Françoise Porte, who had been introduced to him in 1949 by his brother Geer. Seeking a “place that would appeal to him”, he spent several months in Burgundy painting large gouaches. From then on Jacques Putman and Michel Guy, who had recently been introduced to the painter by Putman, provided Bram with financial support in the form of a monthly income. Back in Paris in 1955, Bram moved into a studio in the boulevard de la Gare, which had been bought by Samuel Beckett, Georges Duthuit and Françoise Porte. This studio was subsequently occupied by the painter Asger Jorn. Bram Van Velde was always impeccably elegant and wore a suit while painting. In an interview with Claire Stoullig, Françoise Porte tells us that the artist never reworked his painting. He used Japanese brushes kept perfectly clean (in the catalogue to the retrospective at the Centre Georges Pompidou in 1989). An exhibition was held at the Galerie Michel Warren, with the seven paintings that Bram had painted that year. A laudatory article by Léon Degand appeared in Aujourd’hui, Art et Architecture: “Bram Van Velde pursues, under an apparent formal anarchy, to express a very moving pictorial logic,” and speaks of “wild splendour” and “great sumptuousness, both chromatic and formal… the effect of a very precise language” (no. 3 May–June 1955). In his book L’Art abstrait, which appeared in 1956 (Albin Michel), Marcel Brion perceived the artist as a “pure romantic”. In May 1957 Michel Warrren presented a second exhibition of Bram’s work. The writer considered that reproducing the dialogue between Beckett and Duthuit on the invitation would only disserve Bram. The critics made no comment of significance, besides Léon Degand, who saw in the recent works “inner struggles which determine the strange vitality of its compositions” (Aujourd’hui, Art et Architecture, no. 13 June 1957). Bram offered Beckett his first lithograph made at Mourlot’s. In 1958 a first retrospective of Bram Van Velde’s work was held at the Kunsthalle in Bern, with a catalogue by Franz Meyer. His friends Samuel Beckett, Michel Leiris, Michel Guy, Andrée and Jacques Putman, Pierre Alechinsky and Georges Duthuit attended, as well as Jean Messagier, who gave a large party for the event at his windmill in the Franche-Comté. Bram returned to Paris, but the unstable political climate with the attacks by the Organisation de l'Armée Secrète (OAS) soon drove him away again. He sought refuge in an abandoned village in Provence, Fox-Amphoux, and these new surroundings introduced more light to his work. In the autumn of 1959 Bram went to live at Tardais in Normandy, where he prepared his retrospective at the Stedelijk Museum in Amsterdam, with a catalogue with texts by Samuel Beckett and Jacques Putman. Here he learned of Marthe’s death, run over by a car in Paris. In 1960 he stayed in Geneva, where he had been invited by Vivette Krugier. He met her sister, Madeleine Spierer, who became his companion. He lived in Belleville in Paris with Jacques Putman in a house that he had been lent by Pierre Alechinsky. In 1962 he moved into Penalba’s former studio in rue Gît-le-Cœur. Three significant events occurred during this year: the retrospective at the Galleria dell’Obelisco in Rome, with catalogue prefaces by Umbro Apollonio and Xavier Fourcade; the retrospective with 32 works, including a gouache that belonged to Samuel Beckett, at the Gallery Knoedler in New York, which Bram visited for the first time with Jacques Putman and Pierre Alechinsky (the exhibition was not a great success); and finally, in October Jean Krugier inaugurated his gallery in Geneva with an exhibition of 40 paintings by Bram and published a catalogue review, Suites, in the spirit of Derrière le miroir, with lithographs. In 1964 there was an exhibition of 22 recent works at the Gallery Knoedler, shown in museums, including those of Minneapolis and San Francisco. Catalogue. 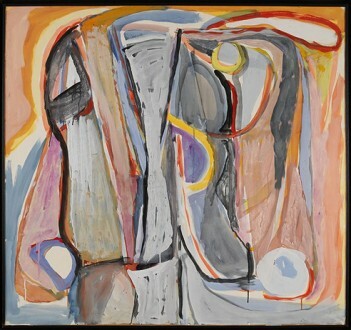 This was the second visit to the United States for Bram with his friends Putman and Alechinsky, and during this time he met Willem de Kooning. In 1965 he moved into a new studio at number 29 boulevard Edgar-Quinet, lent by the building’s architect, Marc Le Caisne. Bram chose, however, to live in Geneva at Madeleine Spierer-Levy’s, although he made regular visits to Paris. He spent the summer of 1965 at Bougival at Alechinsky’s, who showed him how to paint with acrylic and with inks. After this experience he returned to gouache. Retrospective of 34 paintings from 1924 to 1965, at the Wallraf-Richartz Museum in Cologne with a catalogue. As Bram once again had no Paris studio, Michel Guy lent him a space in Ivry. A number of exhibitions followed. He did not receive official recognition until the age of 75, however, with the retrospective at the Musée National d’Art Moderne de Paris. Catalogue. Bram Van Velde participated in few group exhibitions. For France we should mention, in 1958, L’Art hollandais depuis Van Gogh at the Musée National d’Art Moderne de Paris and the Salon de Mai, from 1956 to 1970. For Jacques Putman, Bram Van Velde cannot be considered as one of the leaders of Art Informel, as he “aimed at returning form to formlessness, the form of our life which has no form, and does not give a formless equivalent of formlessness” (Le Musée de Poche, 1958). Bram Van Velde’s entire life revolved around his painting. He was completely independent and never possessed anything. For Bram, “painting is living. Through painting I push back the world which prevents life and one constantly risks being squashed,” he confided to Charles Juliet (Rencontres, Fata Morgana, Paris, 1978). He painted flexible forms, which bend into an A or a V, barely retaining a burst of colour. In an area imposed by the format of the paper or the canvas, he allowed contradictory forces to appear that generate optical reactions. The rhythmic forms correspond with an apparent disorder corrected by black rings. Everything is ordered and disordered before our eyes. At the end of his life Bram used only three colours: black, mauve and red, creating transparency. 1989 Rétrospective Bram Van Velde. Musée National d’Art Moderne, Centre Georges Pompidou, Paris. Catalogue, texts and prefaces. Complete Biography and bibliography. His works, about 200 pieces in all, are mainly in private collections. Museums: Paris National d’Art Moderne – Saint-Etienne – Fondation Maeght Saint-Paul-de-Vence – Geneva – Pittsburgh – Bilbao – Humleback. Samuel Beckett-Georges Duthuit-Jacques Putman: Bram Van Velde. Le Musée de Poche. G. Fall, 1958. Several contributors: Celui qui ne peut se servir des mots, Hommage à Bram Van Velde. Fata Morgana, Montpellier, 1975. Rainer Michael Mason-Jacques Putman: Les lithographies Bram Van Velde. 1923–1973, Yves Rivière, Paris, 1973. Jacques Putman: Catalogue raisonné de l’œuvre peint 1907–1960, Guy Le Prat, Paris, 1961.